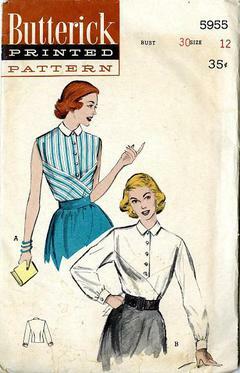 1951 Butterick #5955 vintage sewing pattern, misses' club-collared blouse buttons down to the point of the obliquely crossed sections. This design is very effective in striped fabrics. V. A sleeveless blouse has a contrast collar. V. B long sleeved version, french cuff.